Lewes Bonfire is a series of celebrations that constitute Great Britain's largest Bonfire Night festivities. 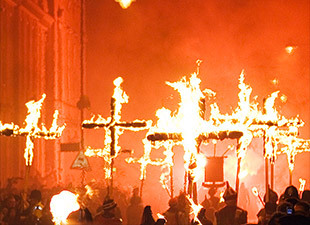 Lewes has been called the bonfire capital of the world. It is held on 5th November (unless it falls on a Sunday, in which case it's held on Saturday 4th), and marks Guy Fawkes Night, as well as commemorates when seventeen Protestant martyrs from the town were burned at the stake for their Protestant faith during the Marian Persecutions of 1555. Pictured is the Procession of the martyrs' crosses courtesy of Andrew Dunn. Lewes is the county town of East Sussex, England. It lies approximately 7 miles north of Newhaven, and 7 miles northeast of Brighton. Pictured left is a view over Lewes courtesy of Missjensen. Licensed under CC BY-SA 3.0 via Wikimedia Commons.